Investment claims have exposed the vague nature of the standards by which arbitral tribunals are expected to adjudicate them and the policy reasons which explicitly or implicitly have an influence. The ad hoc nature of the tribunals and the decisions reached on various controversial issues have brought to the fore the issue of consistency. Andres Rigo Sureda's Hersch Lauterpacht Memorial Lecture examines how arbitral discretion is exercised in the face of uncertainty of the law. 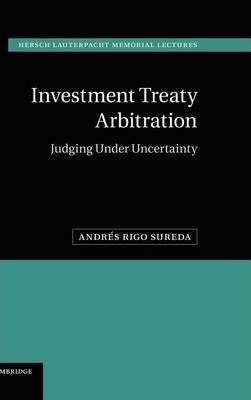 It explores the choices made by arbitral tribunals as they approach treaty interpretation, as they search for limits in determining jurisdiction and the content of the standards of protection and as they search for consistency in the exercise of arbitral discretion. Introduction; Part I. Discretion: The Search for Meaning: 1. Uncertainty, judicial discretion and policy; 2. Treaty interpretation; Part II. The Search for Limits: 3. Form or substance: the nationality of corporate claims; 4. Multiple approaches to define investment; 5. Legitimate expectations, risk and due diligence; Part III. The Search for Consistency: 6. Principles; 7. Precedent; 8. Publicists; Conclusion. Andres Rigo Sureda is a judge on the Administrative Tribunal of the IMF and a member of the Sanctions Committee (the Anticorruption Tribunal) of the Inter-American Development Bank. He has extensive experience as an arbitrator and mediator in commercial and investor-States disputes and served with the World Bank in various capacities from 1973 to 2000, including Assistant General Counsel and Deputy General Counsel.